When you throw your food's plastic packaging into a blue bin you probably don't expect it to be exported across the world to be dumped or burned. But that's exactly what could happen. 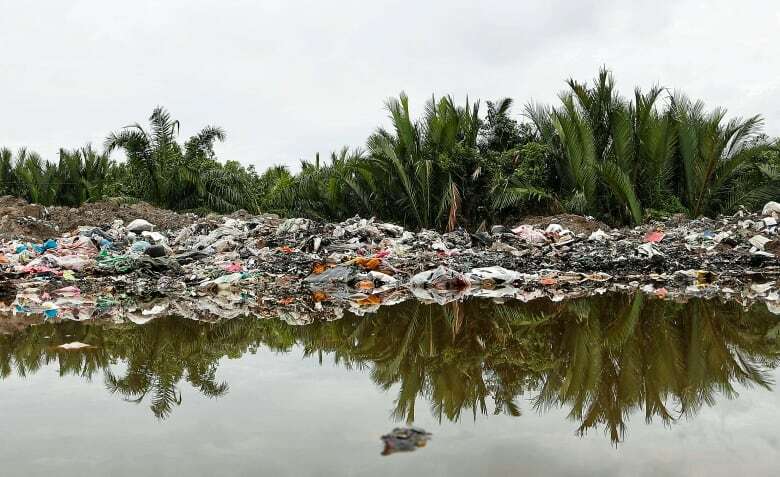 Exclusive images provided by Greenpeace show mountains of plastic packaging dumped next to palm plantations, near waterways and burned on the roadside in industrial areas to the south of Malaysia's capital, Kuala Lumpur. Malaysia imports plastic waste from all over the world, including Canada. Much of it is recycled, but some of the materials may be discarded due to poor quality, contamination or degradation from being improperly stored outside in the tropical climate. Among the piles were pieces of plastic that came from Canadian grocery stores including a bag from Sobeys, a milk bag from Nova Scotia dairy Scotsburn and a burger bun bag from Ben's Bakery. Despite being the source of a huge amount of plastic packaging, Loblaws and Sobeys, the two largest Canadian-owned supermarket chains, don't have targets — or at least none they were willing to share with Marketplace — to reduce the amount of plastic they sell in their stores. "Things need to change," said Sylvain Charlebois, an expert in food distribution and policy at Dalhousie University in Halifax. He says single-use plastics such as those used for food packaging are becoming increasingly controversial and that "companies will need to comply with what the public is beginning to expect of them." As Marketplace discovered, that process is much further along in the U.K. compared to Canada. Retailers there have begun to take major steps toward removing plastic from their stores. 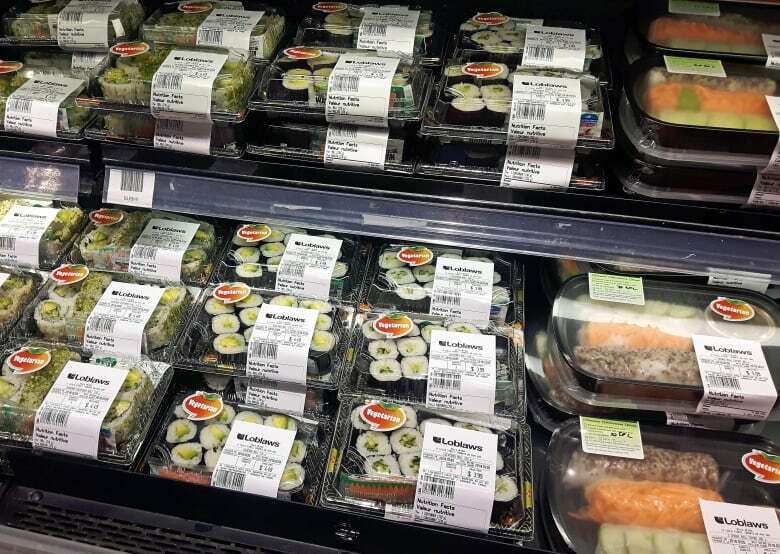 Iceland, a U.K.-based chain that specializes in frozen products, is the first supermarket in the world to commit to removing all plastic from its own products within five years. Morrisons, another large British chain, has banned single-use plastic bags and allows customers to bring reusable containers for meat and fish. The company has also removed packaging from fruit and vegetables on a trial basis in some stores. Thornton's Budgens, a branch of the Budgens chain located in London's Camden borough, has gone even further, becoming one of the first supermarkets in the world to introduce completely plastic-free zones throughout the store. In 10 weeks, the store eliminated the use of plastic packaging for nearly 2,000 products including fruit, vegetables, bacon, fish, baked goods, cheese and takeout food. "We are trashing the planet, and for me, plastic has become … one of the things that's wrong with our society today," store owner Andrew Thornton said. "We took action because we could and we felt we could make a difference." Fruit and vegetables are packaged with compostable beechwood netting made from sawmill offcuts or have no packaging at all. Bakery products are sold as is or packaged in paper, and cheese, fish and some meats are wrapped in wax paper or compostable cellulose wrap. "Our customers love it," said Thornton, who plans to have the whole store "virtually plastic-free" in three years. WATCH: British anti-plastic campaigner Frankie Gillard is shocked to see how much plastic is used to package groceries in Canada. But to take those further steps, he says he will need co-operation from major suppliers like Nestle, Unilever and Coca-Cola to find alternative packaging for their products. 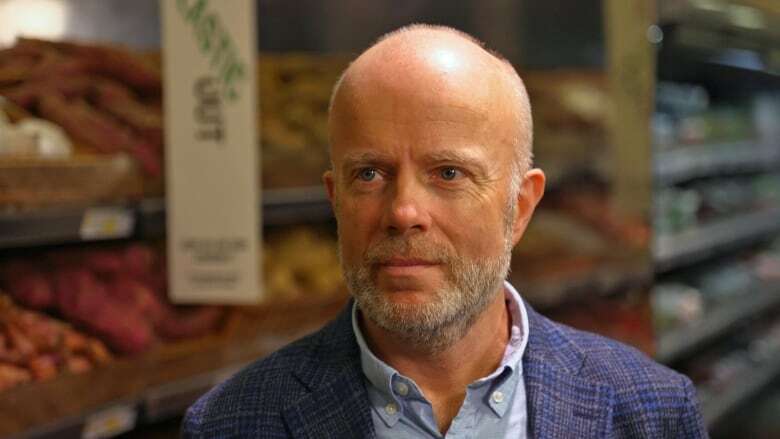 Frankie Gillard of the environmental group A Plastic Planet, who oversaw the project at Thornton's Budgens, says big supermarkets have the power to get major brands to switch to more sustainable packaging methods. "You basically say, 'We're going to de-list your product otherwise,'" she said. "They have the power to make or break a brand. So, of course, they have the power to say how it should be packaged." If public opinion could help push the grocery giants in that direction, those mountains of plastic waste in Malaysia might provide an added sense of urgency. Until recently, for much of the developed world, recycling meant shipping plastic to China, where it was bought as a commodity and processed cheaply to be used in new consumer products. Western countries had grown used to this solution rather than re-processing all of their materials at home. Nearly half of the world's plastic trash has been sent to China since 1991, according to a University of Georgia study. But this all changed in January 2018, when China closed its doors to much of this waste as part of an effort to reduce pollution in the country. The University of Georgia study estimates the move could lead to 111 million tonnes of global plastic waste having nowhere to go by 2030. Marketplace contacted municipal waste managers in cities across Canada to find out what impact the change has had one year on. While the challenges varied across the country, many municipalities are still facing major headaches. "It's a buyer's market out there. We're not selling material anymore, we're paying people to take it," said Matt Keliher, manager of solid waste for the City of Halifax. The business of finding markets for Canada's plastic waste has become "hyper-competitive," he said. Keliher wouldn't reveal the destination for plastic collected in Halifax's blue bin program for fear the city could be undercut by other municipalities. Sharon Howland, head of program management for the City of Calgary, said the municipality used to send 50 per cent of its recyclables to China. Calgary still hasn't found a destination for some materials, including those plastic clamshells used to package things like cherry tomatoes, salads and berries. "We're storing that material in trailers at one of our facilities," she said. Toronto and Montreal have been less negatively affected by China's decision. Waste officials in those cities told Marketplace they work with recyclers based in Ontario and Quebec. 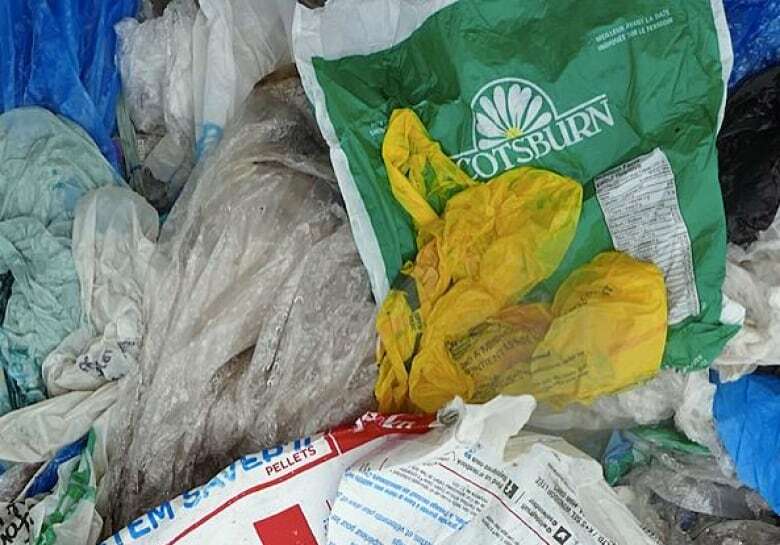 However, both cities are still struggling to find markets for what is known as film plastic, which is used for shopping bags, bread bags and dry cleaning bags. "Film is a problematic one, as all of it was going to China before," said Nadine Kerr, manager of processing and resource management for the City of Toronto. And it is this type of plastic — including some apparently shipped from Canada — that Greenpeace found dumped in Malaysia. Malaysian government statistics provided to Greenpeace show a sharp increase in global plastic exports to that country since China introduced its new restrictions. In the first six months of 2018, Canada shipped more than 16,000 tonnes of plastic to Malaysia. 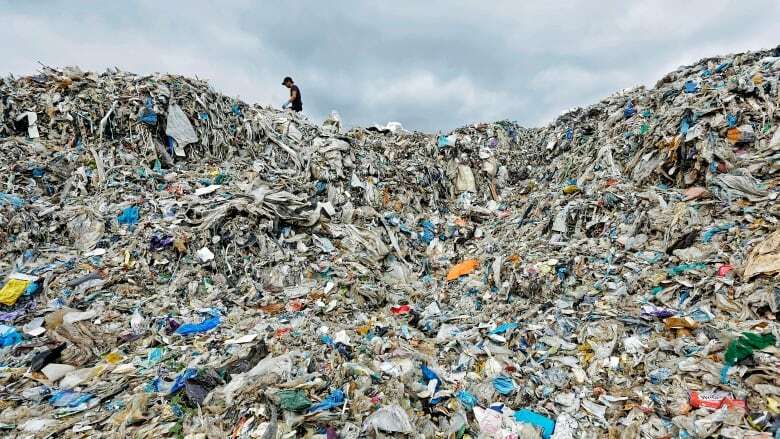 Reuben Muni, Greenpeace's Malaysia program manager, says the country's recycling industry is "overwhelmed by the huge influx of imported plastic waste." He says the global recycling system is broken and that fixing it will require the co-operation of the wealthy countries that produce so much of the waste and the countries that import it. Since mass production of plastic began in the 1950s, the world has produced 8.3 billion tonnes of it. In Canada, just 11 per cent of plastic gets recycled, and globally that number drops to nine per cent. Plastic has been found in the Arctic, in the deepest trenches of the oceans, in the air and in our food. By 2050, it is believed there will be more plastic in the world's oceans per tonnage than fish. Unlike materials such as aluminum and glass, plastic can only be re-processed a finite number of times. This means even the plastic we do manage to recycle will eventually end up as waste. Once discarded, it takes hundreds of years to break down. A University of California, Santa Barbara study estimates that 40 per cent of plastic is used for packaging. But reducing the amount we use as consumers is difficult when retailers provide few alternatives. The shelves at Canadian grocery giants Loblaws and Sobeys are filled with plastic-wrapped products. Fruit, vegetables, eggs, bakery products and even coconuts are wrapped in plastic packaging. Meat and fish are sold in difficult-to-recycle foam trays, and ready-made takeout food is sold in black plastic trays that aren't accepted for recycling in most of Canada. Loblaws and Sobeys customers reveal how much plastic packaging comes with their groceries. Both stores also still provide customers with single-use plastic shopping bags, although Loblaws says it provides a billion fewer bags a year since introducing a small fee in 2009. 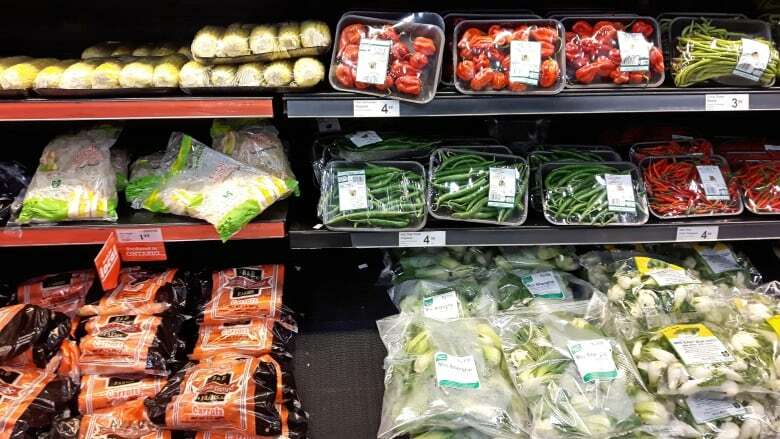 Marketplace reached out to both Loblaws and Sobeys to find out their targets to reduce plastic packaging in their stores. In a statement, Loblaws did not reveal any specific targets, but the company did say it recognizes that "plastic packaging is an area that needs considerable attention" and that it will take "incremental steps" to tackle it. The grocery giant says it has reduced total packaging by 4.9 million kilograms since 2009, but didn't provide a specific figure for plastic. Sobeys did not respond to repeated requests to share any steps the chain is taking to cut down on plastic. As for Thornton in London, he hopes the big stores will be inspired to follow his lead. "If we … can do this in 10 weeks, what could a Loblaws, or a Tesco, or a Walmart do if they put all their resources behind it?" he said. "That's when the big change happens."